The Times New Roman: Nail Polish Obsession Tag! Glitter. It's so beautiful to look at and adds a touch of excitement to everyday life. However, after a certain age, it takes a specific personality type to pull it off. OPI! I'm not a big fan of China Glaze. Essie is decent but it doesn't come close to OPI. On average, every few days. I usually do one color for the week and one for the weekend. I have very fair, cool skin. Blues look great but I suppose I enjoy taupes as well... I have so many favorites. I think a traditional cool toned red polish goes well with almost anything and is classic. I prefer neutrals. Darks look good (greens, blues, purples, reds) but I tend to steer away from black because it can look pretty harsh against my milky complexion (Elvira, anyone?). Brights are lots of fun in the spring and summer but aren't necessarily the most flattering against my coloring. OPI Rainbow Connection over LA Colors Color Craze Live (metallic silver). In! I'm in love with them right now. I think they're so unique and sophisticated. I use China Glaze's Matte Magic on top of standard polish and it transforms it beautifully. Nah. I used to do it in high school but it never looks natural on me. I think it can be lovely on short-medium natural nails with very fine tips. But to be perfectly honest, I think it has become a dated look. 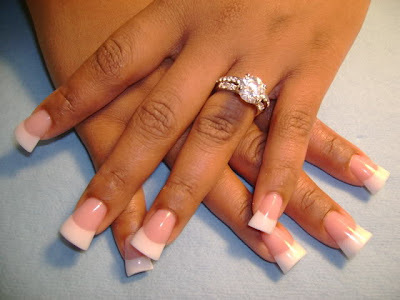 Nothing is worse than long, fake nails with thick, stark white tips. Reds/Greens/Golds for the holidays. Blues and Silvers for January. Reds/Pinks/Glitters for February. Purples/Greens/Oranges for March. I definitely get festive and associate months, seasons and holidays with colors, then style my nails accordingly. Yes, I have a problem. Pinks and Lilacs. OPI Rumple's Wiggin' is a favorite.